Last night Katie Cowell appeared on BBC 1’s The One Show a special episode that took place in Wales to celebrate the Welsh leg of the Queen’s Baton Relay. 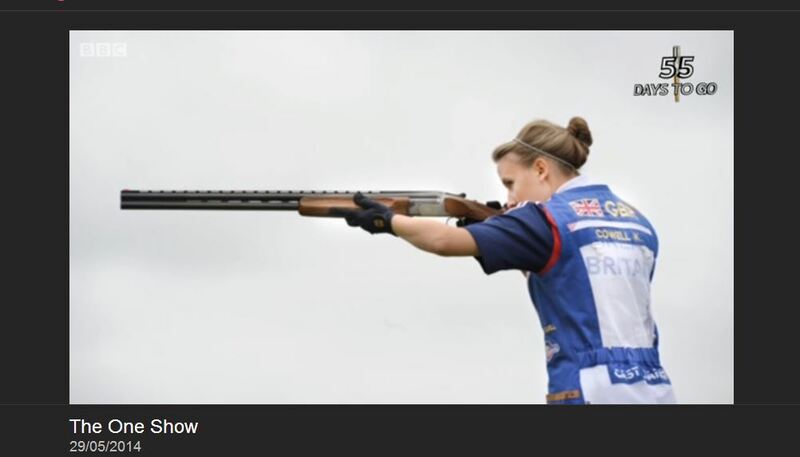 Katie appeared to talk about being picked for the Welsh shooting team at the Commonwealth Games this summer. The Mitsubishi Motors Badminton Horse Trials took place from Wednesday 7th May – Sunday 11th May, 2014. Together with the Rolex Kentucky Three Day and the Burghley Horse Trials, Badminton forms the Rolex Grand Slam of Eventing. The Badminton is widely known as one of the world’s toughest and most exciting equestrian events, featuring three days of intense competition. Horses and riders begin with a dressage testdemonstrating Obedience, Discipline, Accuracy and Elegance. Next is a 4 mile cross country ride jumping solid man-made and natural obstacles within a set time. On the final day is a course of show-jumps designed to test their agility and accuracy at speed. Australian Sam Griffiths won the competition aboard the 11-year-old mare Paulank Brockagh, though he was closely run by past champion and MacWet sponsored rider, Oliver Townend. Badminton is a 4 Star Event, the highest grade and one of only 6 such events in the world making Oliver’s achievements even more impressive. In atrocious conditions, Oliver needed all the help he could get from the unrivalled grip of his MacWet gloves.